> This was the address we were given to get to Turquoise Mountain Foundation. Just like most the addresses here. Go past the bombed out building, turn past the well, etc. Every time we heard directions we had to laugh, which bombed out building, what well? The effects of the war are still so evident, but ever so often we see a rose garden or beautiful restoration projects such as these. 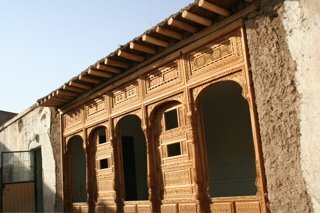 This group is helping revive the ancient arts of woodworking, Herat glass, Calligraphy. Restoring the old tile work and many other projects including restoration of the old Islamic art pieces. President Karzi and Prince Charles are co-presidents of this group. We had tea with Carey an intern from Southern California who is here working on this project and the CEO Rory Stewart. We will keep in touch as our embroidery projects get to the place of documentation and resurgence.